Maciej Kranz brings 30 years of computer networking industry experience to his position as Vice President, Corporate Technology Group at Cisco. He leads the group focused on incubating new businesses, accelerating internal innovation, and driving co-innovation with customers and startups through a global network of Cisco Innovation Centers. Prior to this role, he was general manager of Cisco’s Connected Industries Group, where he drove IoT business for key industrial markets. 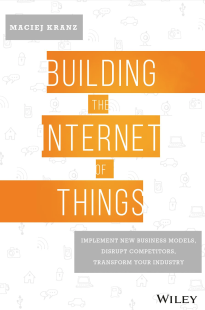 In his new book, Building the Internet of Things, Kranz offers practical advice to business decision makers on how and why to implement IoT today. Let’s begin by discussing the reality of IoT – where is it making a difference in the workplace right now? What should marketers know? Most of the current IoT implementations are in the business-to-business (B2B) area and are focused on improved efficiency and productivity around existing processes. The real payoff from IoT comes down to automating existing processes that have a large labor or time component and streamlining the related process in one way or another. The resulting improvements, despite having measureable business impact, are mostly evolutionary. Companies should focus first on streamlining and improving existing processes, which will deliver fast paybacks. This in turn sets you on the path toward more revolutionary applications, new business models, and incremental revenue streams. For example, you might use IoT to automate a data collection process you now do manually or remotely monitor something that otherwise requires a person to actually visit the physical location. Such solutions are already well proven and documented. Down the road, many breakthroughs in IoT will also come from the B2B2C (business to business to consumer) domain, but today they are just starting to emerge, pioneered by early adopters: processes like mass customization, food safety, and even autonomic car or drone transportation/delivery. Manufacturing around the world is having a renaissance of sorts, and IoT is part of the reason. By converging previously siloed sensors, machines, cells, and zones, IoT-driven factory automation helps enterprises integrate production and business systems and then bring everything online over a single network. Organizations are gaining flexibility to quickly adapt to changes, whether for new product introductions, planned product line changeovers, or other adjustments. The real-time information also links back to the entire supply chain, so each step in the manufacturing value chain, from supply through production to distribution, can respond as quickly as needed. 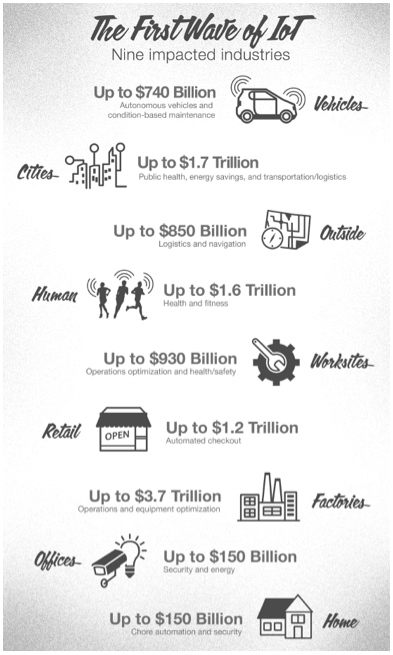 Similar gains are being achieved in transportation, utilities, agriculture, building automation, education, retail, health care, sports, and entertainment—even the military. Marketers should understand that IoT presents an opportunity for every organization, not just a few chosen companies. Even small and midsize enterprises can participate. Winners will transform their businesses based on open standards and build ecosystems of partners to deliver vertical solutions based on horizontal capabilities. No single company should try to implement IoT alone, especially when focusing on a particular sector’s line of business processes. Meanwhile, losers will ignore these changes and stick to their old business models based on proprietary or semi-proprietary technology and ensure customer lock-in until those customers steadily abandon them. One of the case studies in the book is Harley-Davidson – can you tell us about their success? Harley-Davidson was facing intense global competition while its core market was aging and new younger buyers wanted a different type of motorcycle. It needed to get agile, to be able to respond to changes fast, and to be more efficient and productive. And it was IoT that gave Harley-Davidson the capabilities it needed. Harley-Davidson faced the familiar litany of problems encountered by many American businesses, especially large and market-leading companies or those with ambitions to be so in their industry. Labor was too costly. Production was not aligned with IT operations. Islands of incompatible data were everywhere. And, most significantly, this led to a profitability increase between 3 and 4 percent! How should organizations approach IoT security? Security has become one of the leading inhibitors to IoT adoption. I’ve stopped counting how many conferences and customer meetings I’ve attended where IoT security was a top concern, and for good reason. You can no longer rely on physical separation. Everything must be connected. How long would your organization be able to function if email and the Internet went down? Everything, virtually every business process, depends on the ability to connect. Identify the likely individual threats. Assess each threat in terms of its likelihood of occurring and the damage it can cause. Identify and deploy defensive measures appropriate to each risk’s likelihood and potential damage. IoT doesn’t have a magic security bullet. The scope and variety of IoT solutions effectively prevent the emergence of a no-fail security defense. The upsurge in Distributed Denial-of-Service (DDoS) attacks, which disrupted a number of the most popular Internet sites in October, is another wake-up call for industry. The attacks took advantage of default names and passwords. According to a recent Verizon study, 75 percent of all known security incidents exploited known vulnerabilities, and half of them were waged internally. IoT security is everybody’s responsibility. Vendors must implement more sophisticated security mechanisms, drive standards, and interoperability, much like the Wi-Fi industry did some 15 years ago. At the same time, users must become aware of security requirements and protect themselves accordingly. Businesses must implement policy-based security architectures that target requirements before, during and after incidents. Finally, employees must incorporate security into everything they do, encompassing both physical security and digital security. I am optimistic that industry is increasingly focused on addressing security problems. Also, IoT technology is constantly changing, the solutions are continually evolving, and so, too, are the threats and attack vectors. You are dealing with active adversaries who are constantly working to outsmart you and your defenses. IoT isn’t a one-and-done solution, and neither is your IoT defense. Risk management is an ongoing process that must be revisited at least yearly, perhaps even more often, as different solutions change and new threats emerge. The key for all of us is to be smart and aware of IoT risks—and not to be afraid. 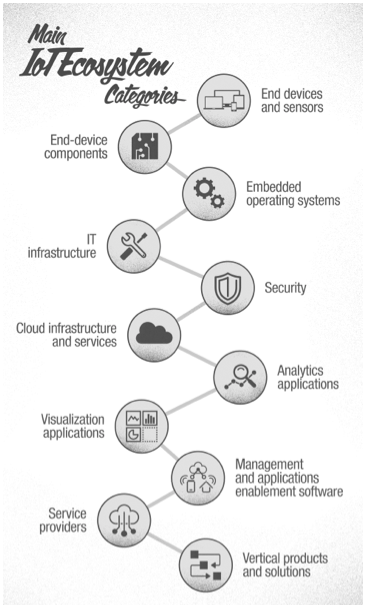 What are the trends you see driving IoT adoption? The lines of business, as represented by the line of business (LOB) manager, are emerging as a major buying center for technology. The convergence of information technology and operational technology is improving communication and efficiency. The proprietary/specialized technologies are moving to open standards. What do businesses need to do to succeed at building their IoT capabilities? Talk about IoT in your organization, help people think about what might be possible when things can communicate with other things. Identify some operational and strategic goals for your IoT initiative—identify a problem to solve or an opportunity to grab. Have a big vision, but start small with a low-hanging-fruit scenario. Pursue one of the four fast paths to payback that thousands of companies have already implemented: connected operations, remote operations, predictive analytics, and predictive maintenance. Introduce OT and IT team members and get them talking. Identify and secure a C-suite sponsor for your IoT efforts. Start with strategy, planning, and preparation. First things first. Lay the groundwork for change by envisioning and articulating ideas for possible changes and innovation to get things rolling. Secure C-suite sponsorship. You are embarking on a multi-year journey that will redefine your entire organization many times over. You need a top management champion to support your efforts starting from your first small IoT project. Build a diverse team. You will need all the help you can get. Your cross-functional team built right will provide critical skills, influence and access. Take time to include potential detractors. Communicate and drive IT/OT convergence. We spoke of this in the previous chapter. We all need to talk with each other and work collaboratively, especially those in IT and OT, but don’t stop there. Every group or unit in the organization needs to become involved sooner or later. Rethink operations from the ground up. How can you do things more efficiently and effectively, faster, cheaper, and more richly when everything is digitized and can communicate with everything else? It may take several tries; this is new to everyone. Design for flexibility. Remember, you may need to rethink your business and operations every three to seven years. Educate and train. Your people won’t automatically understand IoT. A few may intuitively grasp it (make them team leaders), but everyone else needs to be oriented, educated, and trained. Revisit repeatedly. IoT isn’t a once-and-done effort or project. It’s a dynamic thing, always changing and needing to be continuously tuned and optimized. Let’s discuss the value and benefits of IoT. What are some good reasons for companies to begin the IoT transformation? Exactly how much any company gains will depend on how it responds to what IoT reveals. Still, the ROI is there; you just have to dig it out. The areas of impact—especially positive paybacks—have turned out to be surprisingly comprehensive, covering pretty much all operational aspects. The most compelling business case for IoT today is predictive maintenance. Predictive maintenance lowers cost through reductions in unplanned downtime. You can also view it from the other side of the coin: increased uptime. Either way, it boosts production and efficiency. Imagine a transportation and shipping operation with thousands of shipments always in transit and huge pressure to meet overnight, two-day, or whatever-day service commitments. Every unplanned breakdown avoided through well-instrumented vehicles and predictive preventative maintenance can save a bundle. Related to this example are predictive analytics applications in food and food safety, retail, agriculture, and even sports and entertainment. New business models can attract more and different revenue-generating customers, while new service delivery options boost customer satisfaction and convenience and lower support costs. Remote service and support both increases efficiency and lowers costs. New go-to-market strategies can open markets you previously couldn’t effectively address. The wealth of information, about your products and your customers’ use of those products, collected through IoT, can help you develop new and much improved offerings and attract more and different customers. Some of this knowledge, as well as the data itself, can generate revenue, as partners and even customers are increasingly willing to pay for pertinent, timely, and actionable intelligence-as-a-service. You write about the importance of ecosystems – why are partners critical? Can you tell us about the main categories in the IoT ecosystem? Well, no single vendor can deliver a complete IoT solution for every customer. Similarly, it doesn’t make sense for an organization to develop a custom IoT solution for itself. You’ll burn too many resources reinventing multiple wheels that have already been invented. At a minimum, you’re better off developing your vertical solution based on proven horizontal modules, architectures, or platforms that you can readily adapt. Going it alone is too costly, too risky, and pushes any acceptable payback far into the future. IoT is best delivered through a set of partners, each of which contributes its particular capabilities to the complete solution—including your contribution. It has become increasingly clear that user organizations should no longer accept the 20th century model of one vertically integrated vendor providing end-to-end proprietary solutions. Most have heard that message loud and clear. Even vendors realize they can’t do it all alone, much as they might wish they could. What are the 4 fast paths to IoT? The four fast paths explained in the book are connected operation, remote operations, predictive analytics, and predictive maintenance. In the book, I go over detailed case studies for each one. For example, Rockwell reduced the inventory cycle to 82 days and increased time-to-want to 98 percent. The company managed to cut in half the number of rejected parts, effectively avoiding 30 percent in capital expenses. Rockwell credits these gains entirely to connecting all of the devices throughout its plants. Reduced operations costs, because problems are identified sooner and fixed earlier, before things get worse. Variable operating costs, such as gas consumption, are also reduced. Reduced delivery and production disruptions, because companies are better able to meet service-level commitments and avoid any contractual penalties that may apply. Increased on-time delivery, which translates to better customer service. Reduced delay-based system costs, which helps the company avoid the variety of costs associated with delays. Optimized logistics systems, which enable the organization to better optimize its driver, logistics, vehicle, and facility resources for maxi-mum efficiency. The opportunities for value creation are real. What is the government’s role in IoT? Regulators. There will be competition for bandwidth and other resources; there will be ideas that may conflict with public policy; and there will be dubious IoT-based ideas that may present a public safety threat or privacy concern. Think drones. Agenda setters. Who represents the public’s interests in the rush to IoT? Say the government decides it has a vested interest in getting private cars off the road to reduce congestion, save energy, and lower pollution. It must, in turn, encourage the development of autonomous vehicles and other energy-saving initiatives. We’ve seen plenty of positive examples of government involvement in such efforts, including co-funding autonomous car research and industry test beds as well as issuing new policies aimed at accelerating the adoption of such vehicles. Another example is privacy, where governments help explore various models, boundaries, and best practices associated with sharing customer data, as well as with customers’ control over their data. Adopters. Through their spending power, governments can drive the focus and accelerate the adoption of IoT technologies and solutions. Where will the IoT standards for industry come from? The number of legacy, proprietary, quasi-standard, and specialized technologies is simply mindboggling by itself. At the same time, the industry has begun to cull the traditional market structures of vendors out pushing end-to-end, proprietary, single-vendor solutions. If your company is one of those, become involved now in industry standards workgroups and learn how to thrive in an open world if you want to have a shot at thriving in the IoT-driven economy. The biggest players in industry are willingly joining standards development teams. As much as each would love its own approach to become the accepted standard, it’s too costly to develop and, most importantly, maintain by itself over time. Migrating to open standards. As we’ve discussed, major industry players in manufacturing, transportation, and other verticals have historically implemented proprietary technologies or established standards around their own protocols and technologies. This often created conflicting standards, thus inhibiting interoperability and adoption. The IoT industry is working with the major industry standards bodies, including ODVA, to avoid this issue by migrating to open standards while ensuring interoperability with legacy protocols. Creating consortia to address key pain points. Major industry players are joining forces in new consortia, among them the Industrial Internet Consortium (IIC), the Open Connectivity Foundation (OCF), the OpenFog Consortium (OFC), GS1, and the OPC Foundation (for open platform communications). Thanks so much, I hope our readers will read your book, which is already a New York Times Best Seller for business. It is one of the best and most informative in the IoT space.